Home › Birds Eye View › CHECK YOUR SIX! New book out soon! Preorder now! Rejoice! The day is nigh! Our new book is being printed right now! This time it took us less than two years. How about that? 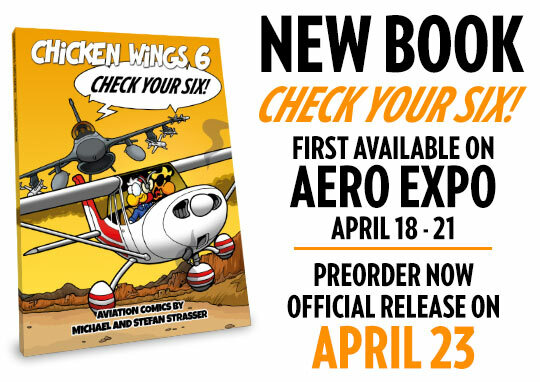 We’ll be officially releasing it at the AERO Expo in Friedrichshafen next month (April 18-21). If you want to be the first to lay your excited little fingers on this new literary masterpiece, you can come visit us in the artist section at AERO (AEROkunst in Foyer Ost). If you can’t make it there, you can preorder your copy now and we’ll ship it out as soon as we’re back (which will be on April 23rd). 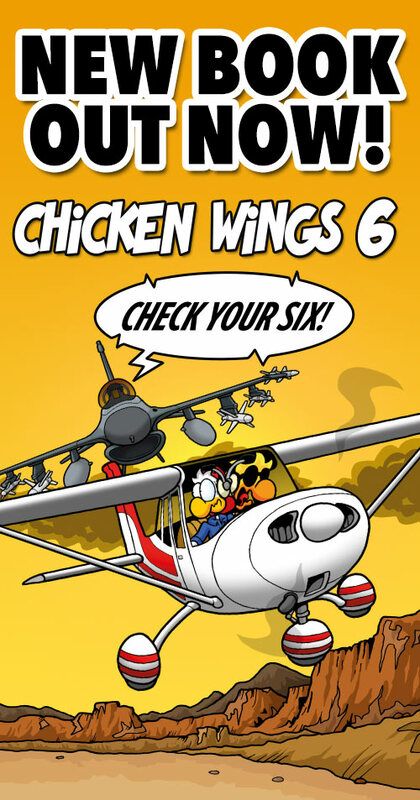 Chicken Wings 6 – Check Your Six: Against all odds, Roost Air is still in business. ­Julio deserves a medal for sticking around this long. Chuck acquires a hangar to move his Corsair ­project along but might get a little sidetracked. Jason is still ­struggling to pass his pilot’s exam which is no surprise when you look at his ­instructor. Hans tries new management strategies and the hangar gets painted. In the end, Chuck makes a flawless landing … or does he? PS: I know, I know, the website is still branded with our last book … I’ll get around to that shortly! ‹ AERO 2018 / New book coming soon!